A Christmas Cactus in full bloom makes an extraordinary gift for gardeners, and non-gardeners, alike. With proper care a Christmas Cactus is very long lived. The one shown here is over forty years old and still provides an amazing display of flowers every Christmas season. Light/Temperature: Prefers a warm location with bright indirect sunlight. Shade it from intense sun and keep the plant away from heater vents, fireplaces and cold drafts. Soil: Plant in well draining potting mix made for succulent plants. Its ideal soil is composed of equal parts of garden loam, leaf mold or peat, and clean course sand. Water: A Christmas Cactus is a tropical succulent, it is NOT a true cactus, therefore it requires more water than a true cactus. Its watering needs vary with air temperature and humidity, but in general keep the soil just barely moist throughout the year. But, do not over water or the stems will get flabby and droop, and don’t under water either or the stems will be shriveled and limp. Note: if your plant tends to dry out and/or wilt frequently, then it’s time to re-pot it into a slightly larger container. Fertilizing: Supply plant with a weak solution of houseplant fertilizer every two weeks. Flowering: The secret to good bud production is cool temperatures and extended darkness. Cool temps: The best temperature for bud development is 55F-61F degrees for a period of 6 weeks. Start providing cool temps in November for Christmas blooming. Extended Darkness: The plant also needs 12 hours of darkness every night for 6 weeks. You can accomplish darkness by covering the plant with a cloth each night or move it into a dark area overnight. For cactus to bloom at Christmas time, darkness treatment should start in early October. Then, when buds start to appear increase its light exposure. Do not move the plant when it starts blooming, because it is sensitive to location during this time. Color: Flower colors ranges from pink, white, yellow, salmon, fuchsia, red and any combination of these. Rest time: In February, after it has bloomed, the plant should have a rest period, so during this month water it sparingly and stop fertilizing. 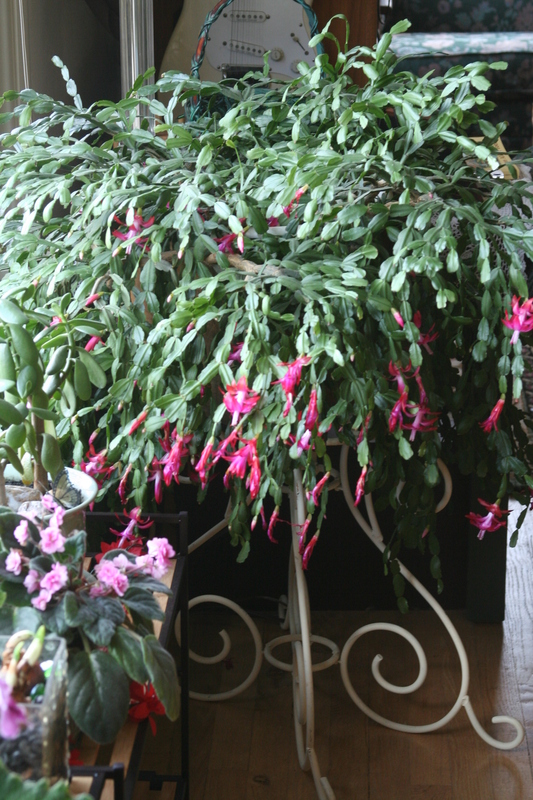 Re-potting: A Christmas Cactus blooms better if slightly pot-bound, so re-pot only when needed every 3-4 years. Re-pot the plant into a slightly bigger pot in the spring when it is not in bloom. Propagation: Propagating Christmas cactus is easy. Cut a y-shaped segment off the tip of the plant, this cutting should have 2-3 joined segments. Allow the cutting to dry for a few hours and then plant it in moist peat & sand soil mix, insert about a quarter of its length below the soil surface. Place it in a well-lit area, avoid direct sunlight and water it sparingly to prevent rotting. In two or three weeks the cutting should show signs of growth at the tips of its leaves, these are usually reddish in color. Once it has rooted transplant it into a pot. Are you longing for flowers during winter’s dark days? Try forcing flowering tree branches to bloom indoors. Cut branches from spring-flowering trees such as forsythia, dogwood, and crabapple and place them in container of warm water for an hour to bring them out of dormancy. Then re-cut their stems to enhance their water absorption and arrange them in a vase which has warm water in it with a drop of bleach added. Set the vase in a sunny window and before you know it, Alakazam, flowers appear! • Decide your plant choices: purchase and/or grow your plants, then plant according to their specific directions, don’t crowd your plants! *Butterflies need water, so make them a mud puddle! Use a shallow dish such as a plastic or terracotta plant saucer in a sunny area of your garden that is protected from the wind. Fill the bottom of the pan with sand, gravel, and a few small stones, add water to the dampen sand. Note: Be prepared for heavy munching on these host plants, these plants are caterpillar food! The Ashland Emergency Food Bank has Ashland’s first pollinator garden recognized by Bee City USA Ashland. It’s in bloom now at 560 Clover Lane. You can see it M-F, 9:00am-12:30, and get ideas for your own garden. Plant list is available. Do you want to get your Ashland garden recognized? Visit the City’s website to learn more.